On Saturday I attended a CPR/First Aid class through Red Cross. I needed to get certified for work. Did you know that CPR has changed? I took a class as a teenager but it was very different. For example, there should be 30 compressions to every 2 breaths. 10 years ago it was only 15 compressions. Do you have any idea how easy it is to get distracted while counting to 30. I kept losing track of what number I was on. How embarrassing! Also, when you find an unconscious person (because they are just lying around sometimes) you don't check their pulse. Apparently there isn't a need to. If someone is unconscious and not breathing 90% of the time it's a cardiac issue. You just start doing CPR. We also learned how to use an AED (Automatic External Defibrillator). That's right, I got to shock my very own dummy! Now I can't say for sure but I think he made it. Look at my pretty pumpkin colored flowers! The Halloween roses were the best! Jonathan and I went to Safeway a couple weeks ago and he surprised me with flowers. He claimed he needed to use the facilities and left for 5 mins while I continued shopping. When we got out to the car and started putting away groceries Jonathan said he wasn't feeling well and asked me to drive home. I was feeling all concerned about him until I opened the driver's-side door and found a bouquet of orange roses. Don't I have a sweet hubby? This is our trunk for the ward Trunk or Treat party. We had a lot of fun setting it up. We had dry ice in a cauldron creating a misting/foggy effect and creepy music playing in the car. And this is Jonathan dressed as a dead groom. That is a black rose he is holding--nice touch huh? 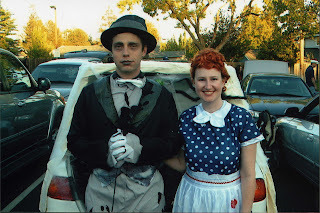 I was dressed as Lucille Ball with a red wig and a polka dot dress. Our costumes were not related but all the ward members thought they were. They kept asking us why Ricky was dead. Hehehe . . .
We have an exciting match today folks. It's champion Tree McTwiggerson against challenger Edmund "Dante" Cristo. Dante is a newcomer to the fighting world but has shown definite promise in the practice ring. Tree is world renown for his phenomenal strength and his signature move known as "The Branch". Let's get started! The customary hand shake . . . And that's the buzzer. Dante takes an early advantage but Tree looks fierce. Things are looking good for the newcomer. Dante has Tree completely covered at the moment. Tree has got himself in a good position but Dante seems to be holding him off. Look at this! It's over folks . . . Dante can't possibly come back after a beating like this. He's barely hanging on. This is an unbelievable match! What an amazing turn of events! Somehow Dante stays on his feet and continues to climb. (He didn't fall--inconceivable!) Wow, it's in the bag now! Dante, achieves a position of dominance and takes a moment to revel it his almost assured victory. But wait . . . he's stopped climbing. Did the judges just signal him? I'm sorry folks but it appears the judges are delaying a ruling on the official winner. Yes, I definitely heard Tree call out a "Best 2 out of 3" before the final buzzer. Dante and Tree acknowledge the skills of the other. The opponents embrace in a gesture of goodwill and true sportsmanship.